I would like to thank the whole team at Chase Motorcycle Movers. From the first day I contacted your company the whole process went perfectly. You were happy with all my requests, the move was made very easy, and to top it off, the pricing was excellent. I especially liked the fact that my bike gear was also transported down with the bike at no extra cost. This is my third interaction with this specialist company who have moved my top of the line BMWK1200LT. Motorcycle around NZ. The first was Auckland to Nelson, then Palmerston North to Nelson and now Blenheim to Timaru. The quote was very fair, the communication to me was of the highest standard and the bike arrived in perfect condition. I wouldn’t hesitate to use this great specialist company again. You have done a fantastic job! I was greatly impressed with your service and the way the whole process was handled. Thanks so much for that. I would highly recommend this company for transporting a motorcycle. I was impressed with the communication and was given a pick up time within a 15 minute time frame the day before. The van arrived precisely on time to pick up a valuable vintage BMW bike. The driver spent some time working out the best way to secure the bike and I received a text 2 days later saying the bike had been dropped off in Christchurch....at the time I was told 4 days prior. These people do what they say they will do and do it extremely well. Delivery was within two minutes of promised time. Bike arrived in perfect condition. Have already recommended them to everyone I know. If you need a bike moved this is the company to do it. I’d like to thank the Chase team for shifting my motorcycle with skill and precision. The pricing was acceptable but utilising this company wasn’t about getting the cheapest deal. I could tell from the initial communication that these guys were as passionate about caring for my baby as I am. They phoned ahead at both pick up & delivery to ensure things were in place and security was maintained. The staff were friendly and professional. The overall experience was pleasant and put me at ease during a hectic and disruptive house moving expedition. If only some of the other companies involved in the family shift could have been this good! I’d highly recommend Chase movers to any other two wheel warriors as they know what they’re doing and put your requirements to the forefront. Using a company to move motorcycle was a first for me, so I had no idea what to expect. After getting a few quotes, I listened to what others were telling me and from what I’d researched myself, decided to use Motorcyle Movers. They were great and here’s why - what they said they would do, is exactly what they did! Communicated all they way through - from Jo in the office to the guy driving the truck doing the delivery, they are onto it ! Also really friendly and their price was good! 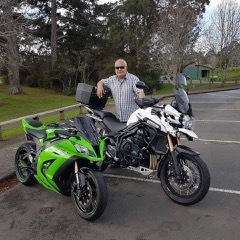 Thanks for moving my new motorbike from Dunedin to Wellington. Your service was amazing! Your communication was fantastic – I received a text to say when you were picking up the bike, that it had been collected and when it would be dropped off. Allan was great. As he said to me "I love motorbikes!" and it shows. I wouldn't use anyone else!! Firstly, thank you for the delivery of my bike! Can I also add, I found you on the web. I obtained three prices and went with you, on the basis you provided me with confidence in your communication and were responsive to queries and questions, noting you were the highest price by a small amount. With the delivery of the bike, I know I made the right choice, particularly recognizing I did muck you around on the delivery time. Thank you again and, on the basis a bloke should own many bikes, we will do business again. Excellent service, communication was brilliant and gave me piece of mind that my bike was collected and going to be delivered on time and safely. not cheap as regards to the service they provided. I would only use them if I ever need a bike transported again, and can highly recommend them to any one else. From the first contact, through to delivery, the communication was out standing. You organised pick up in Christchurch and kept me informed all the way. Best $500 I've spent. I would not hesitate in recommending your service. overall deal. Thanks and cheers, Rex. I recently transported a bike from Auck to Chch with Motorcycle Movers and I couldn’t have been happier. From the very first contact, right through to the delivery and follow up calls, I have received nothing less than exceptional service. And to top it off, they were by far the lowest price quote I got. I contacted ALL the transport companies! I will be using their service again, that’s for sure! I highly recommend their service.